A 21 July suspect went along with an alleged suicide bomb plot because he feared being killed by his co-conspirators, a court has been told. Manfo Asiedu, 34, said he was "waiting for his opportunity" to get away but admitted buying hydrogen peroxide. He told Woolwich Crown Court that he only found out about the alleged plot on the day it was to be enacted. Six men deny conspiracy to murder and to cause explosions across London's transport network on 21 July 2005. Mr Asiedu said: "I didn't know them and I was scared [for] my life and at that point [I thought] I just have to go on and do what they told me to do so that I can get out of that place. "Either I went out and I would be killed by them or I stayed...I perceived that these were terrorists at that point and I could not do anything, I just had to wait when my opportunity arises and I will go." The jury heard that Asiedu helped mix hydrogen peroxide and flour used in the bombs. However, Mr Asiedu said he only found out about the alleged plot when co-defendant Muktar Said Ibrahim showed what would happen when they and three other men detonated their rucksack devices. Mr Asiedu denied suggestions by George Carter-Stephenson QC, for Mr Ibrahim, that he could have left the flat but chose not to because he was part of the plot. Two months into the trial, Mr Asiedu accused Mr Ibrahim of planning an attack "bigger and better" than 7 July's attack on the London Underground. The Crown alleges Ghanaian-born Mr Asiedu is the fifth bomber who lost his nerve and dumped his device in Little Wormwood Scrubs. Mr Ibrahim, who admits making all the devices, claims they were hoaxes and that he did not intend to kill or seriously injure anyone. 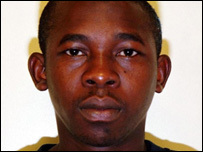 The other men on trial with Mr Asiedu, of no fixed abode, and Mr Ibrahim, 29, of Stoke Newington, north London, are: Ramzi Mohammed, 25 and Yassin Omar, 26, of New Southgate, north London; Hussein Osman 28, also of no fixed address; and Adel Yahya, 24, of Tottenham, north London. The prosecution claims that the men set out to target London's transport network as part of an extremist Muslim plot but the devices failed to successfully detonate.